This palak paneer gravy is reserved for our special dinner-for-two days. Lightly fried soft paneer cubes on a bed of thick spinach gravy rich with the aroma of freshly ground whole spices. I am always so happy with every bite of it. But I have to say upfront this palak paneer recipe is 100% homestyle. My palak paneer gravy, as you can see, is not as green as you would find in a restaurant. Usually the palak paneer gravy is made with just spinach and tomato but I like to add onions and ginger garlic too to the gravy. The onion-tomato base naturally gives the green spinach gravy a thicker consistency and definitely more volume. The quantity is good enough to allow for that little overeating that always happens when I make this recipe and with a little leftovers for one person’s lunch the next day. If I am making palak paneer just for the two of us, I make it stand alone with paranthas. In a menu with more dishes this quantity would be good for 4. Heat 2 tbsp oil in a deep pan. Once the oil is hot add green chillies, ginger and garlic. Sauté for a minute. Add the onions to the oil. Mix well and sauté for 5 minutes till the onions become soft. Now add the spinach. Mix well and cook for a minute before adding all the spices. Just keep about half a teaspoon of the freshly grounded spice mix for adding it at the end. Add about a cup of water. Mix well and cook covered for 10 minutes. In the same pan that you used for dry roasting the spices, heat the remaining 2 tbsp oil. Lightly fry the paneer cubes till they just start to have golden spots. Drain on an absorbent paper. Remove the gravy from heat and grind it to a smooth paste. I simply use my stick blender right in the pot. Return to heat, add the fresh creme (if using) and the remaining spice mix. Mix well and cook till you get the desired consistency. If you think its too thick, add hot water as required and adjust for salt. 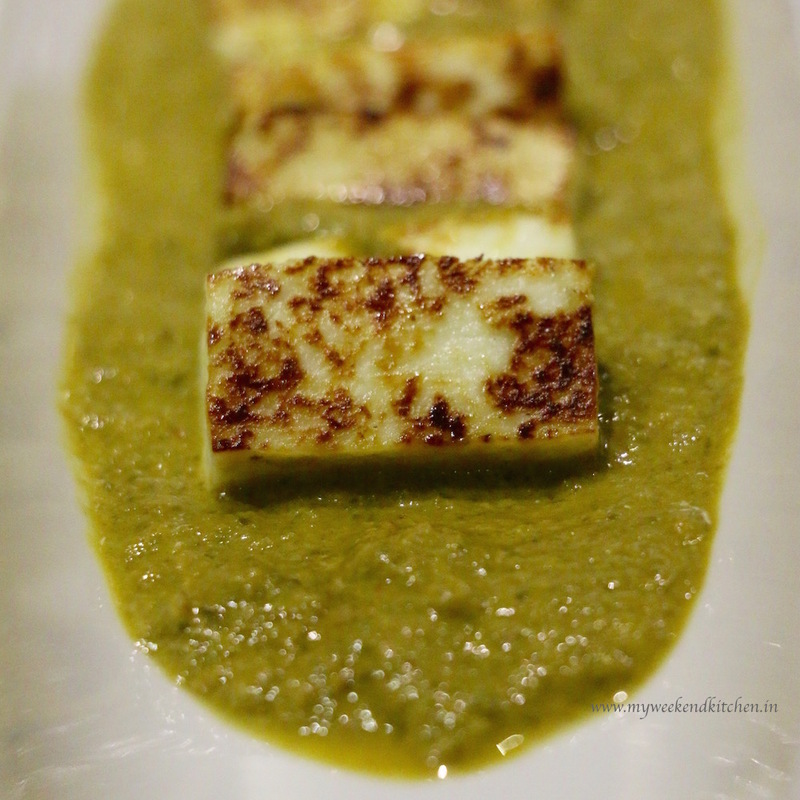 To serve, lay a bed of the thick green spinach gravy and then put the paneer cubes on top. Serve hot with paranthas or naan. Note: For a vegan option, omit the fresh cream.